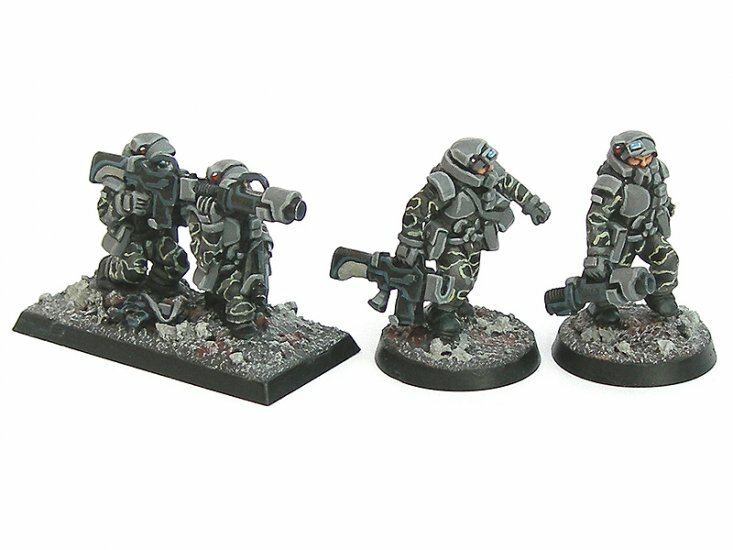 This time the kit in question was DreamForge Games’ set of Eisenkern Stormtroopers, produced by Wargames Factory. Like the major part of my current scifi stuff, I picked these up at Salute this year. 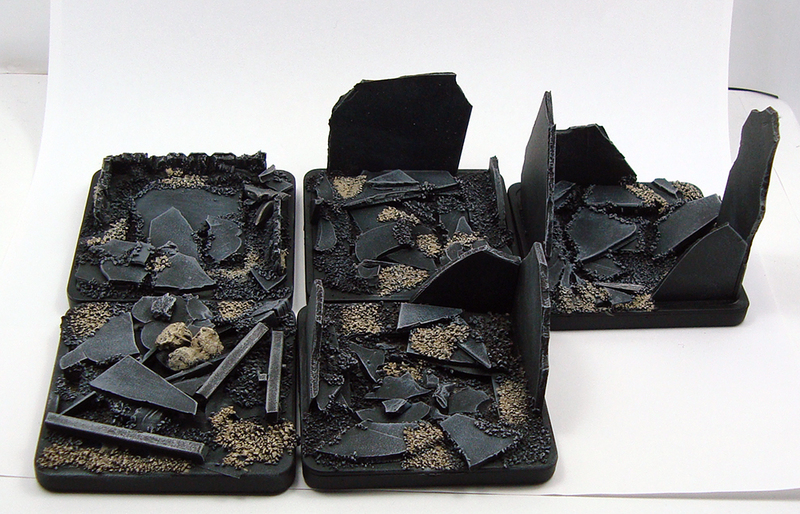 After finally opening the box, I was struck by the quality of the set – crisp castings, not too many mould lines and so on. 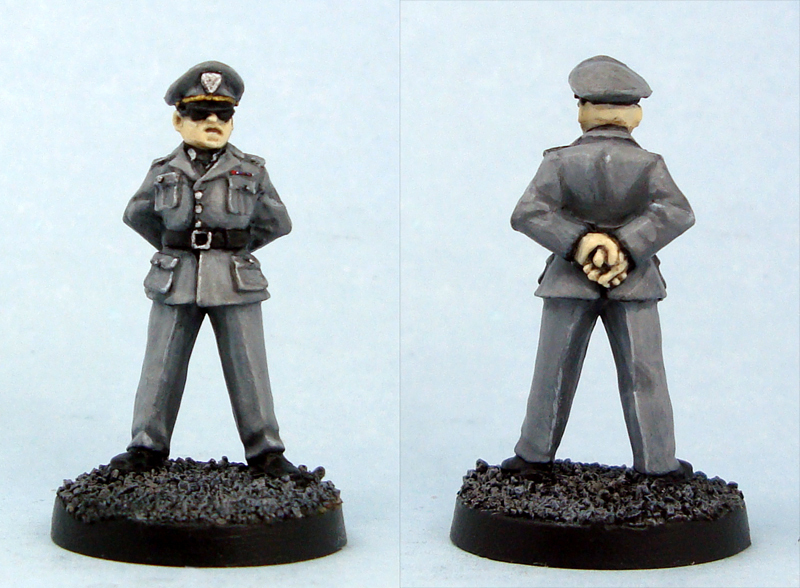 Like I remarked when I bought these, I’m not keen on the whole space nazi look. Luckily I had a bunch of extra Pig Iron System trooper heads, so a few quick headswaps later my Stormtroopers had an all new look. I think the end result is pretty nice! They look lean and mean, the Pig Iron heads work a treat and I can easily imagine them being elite, high-tech troopers – you know, cloaking technology and the like. I also gave one of the troopers a heavier weapon taken from the Defiance Games UAMC set. In the marine set the gun is a support weapon, so I think the Stormtrooper using it as a heavy assault rifle emphasizes their bad-assery. I gave the trooper some shoulder pads as well to make him bulkier – he’s the team “heavy”. 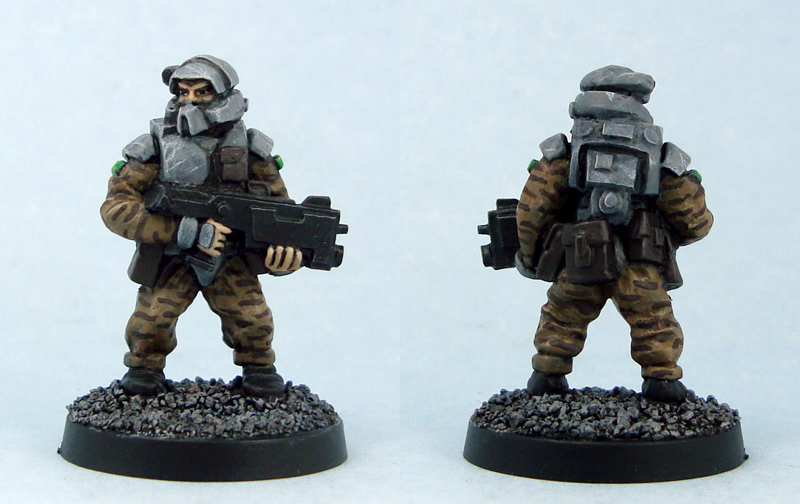 Finished another three of Pig Iron’s Heavy infantry. I hate batch/assembly line painting, so I try to do my best to keep it interesting. This usually results in me adding different ethnicities in units. It not only makes the unit look more interesting, but also better reflects real world and my scifi visions. While WH40K’s Space Marines might be a race of genetically enhanced super-Aryans, I like to make my units a bit more multi-cultural. To illustrate, in 2008 Black and Hispanic members made up over a third of the US Army, and I think the diversity has been, is and will be on the increase. Realism aside, it serves to break up the monotony of a unit wearing the same armour and BDUs. In the latest group of three, I picked three different skin colours. One was my regular caucasian skin tone, one a reddish mid-range brown and one a very dark brown. In my opinion the end result is quite nice, what do you think? I’m slowly getting my painting groove back on, which means I finally finished a few models. 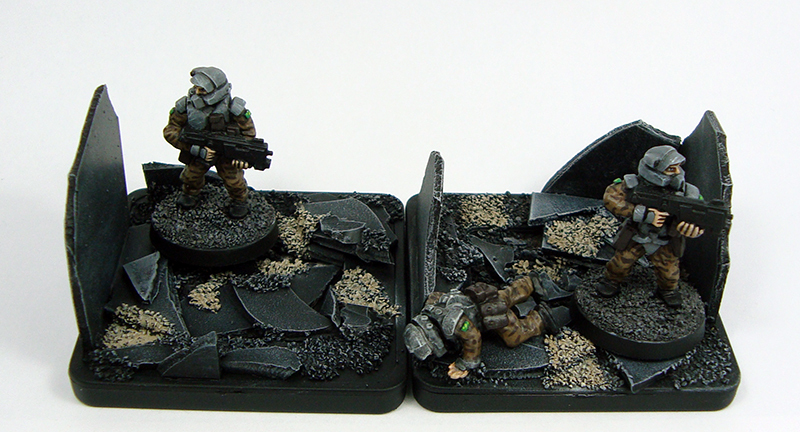 They’re both Heavy infantry by Pig Iron Productions, a part of their mighty fine science fiction range. Like most of my scifi stuff, they’ll find use in my Utopia project. 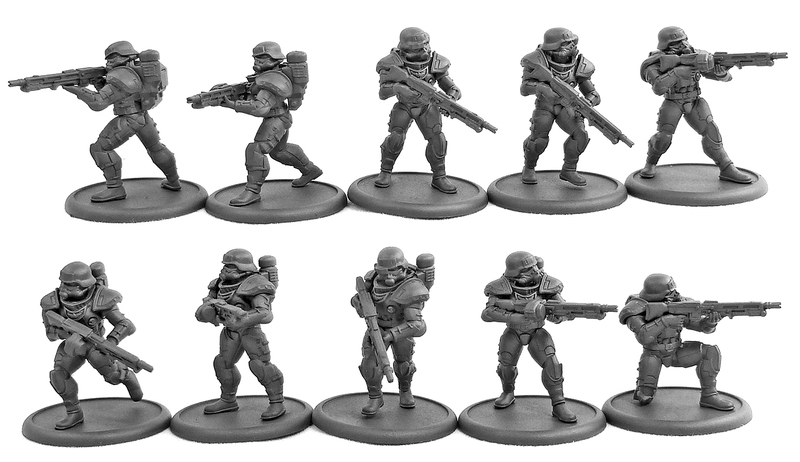 The Pig Iron minis will represent the heavy infantry of the Outer Colonies, a counterpart to the UTOPIA troopers the players are commanding. 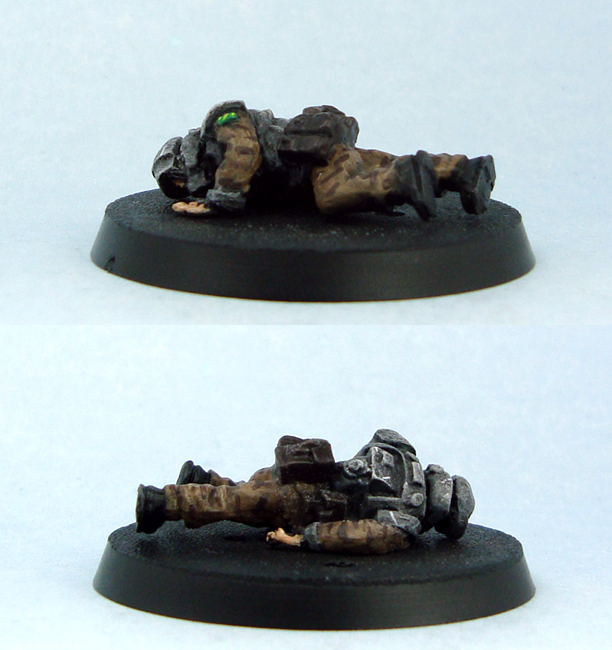 I used the casualty miniature to test the colour scheme. I wanted something very down to earth, so used a combination of browns and grays. In order to keep them from not looking too monotonous, I added a simple horizontal stripe camouflage. 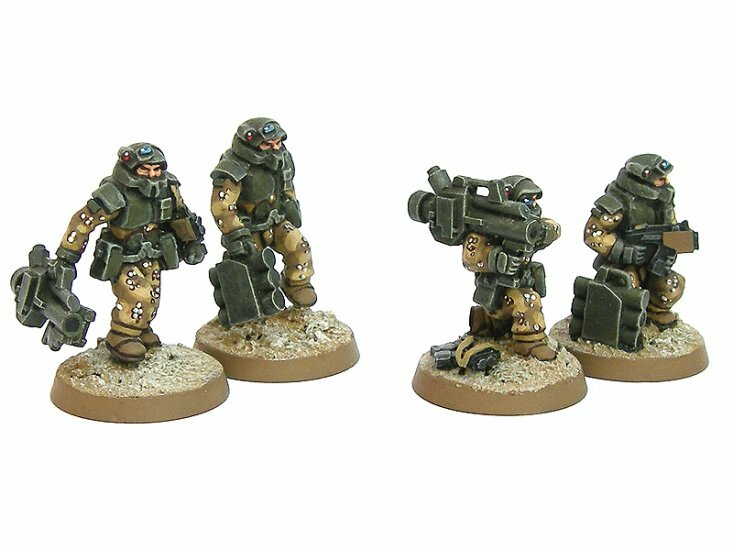 Another reason for the simple camo choice was that I wanted to keep these guys quick to paint. A lot of both models is painted using drybrushing and washes, with scratches in the armour and the camo adding extra detail. The casualty won’t be based, I just put him on a base to ease photography. A special mention must go to the flag patches. 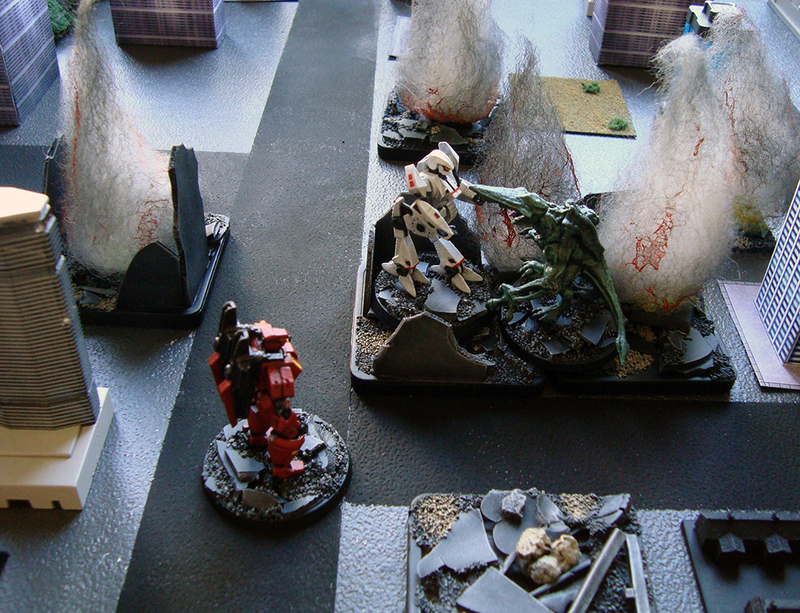 To go with the typical “opposing force is always red” mentality, I was about the make the flag red as well. Luckily I decided to ask a non-gamer friend what she thought would look cool. “Maybe try green, with some yellow?” she said, and that I did. I love how it turned out, as the green really pops from the muted overall look. The Pig Iron minis are a joy to paint. They have a lovely simplicity to them, reminiscent of Mark Copplestone’s work. As Mr. Copplestone is one of my all time favourites, this is high praise indeed. I promised to do a breakdown of what I bought at Salute, so here it is – a month after Salute due to all sorts of hassles. I’ve also listed my intentions for their use, to show they were perfectly sensible purchases aimed at use in games of Utopia. As photographing them all would’ve been a bit of a chore, I’ve used photos from the manufacturers’ websites. 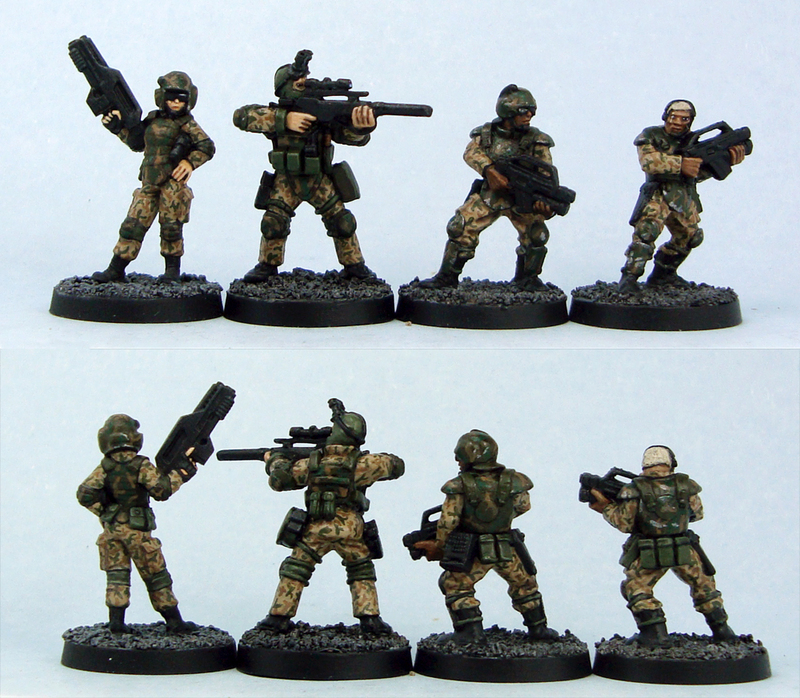 I’ve liked these miniatures since their release, but never got around to buying them. They’ll be painted with a paint scheme more toned down and less retro scifi, and they’ll be used as generic security guards. Get the Time Lift Security here. I’m always on the lookout for good, generic scifi civilians, and these guys fit the bill nicely. They’ll find plenty of use, milling around scientific complexes, battlefields and other places they’re likely to be shot at or otherwise attacked. You can find the station crew here. This is another set I’ve been eyeing for quite some time. 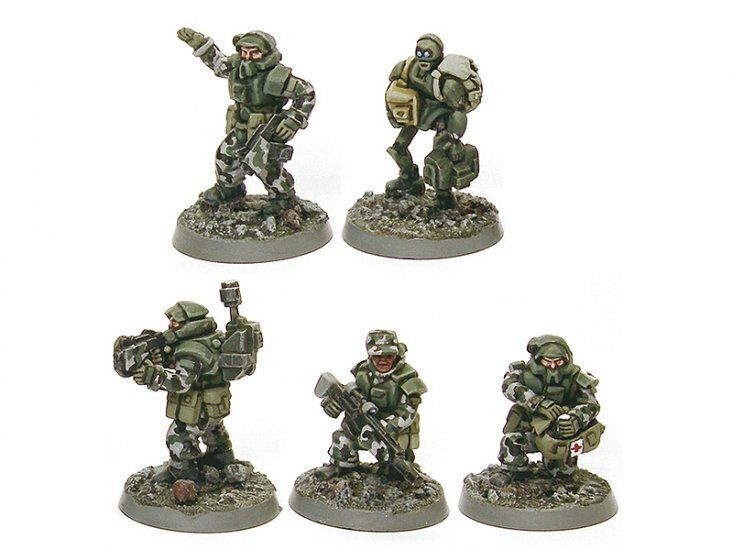 These heavily armoured shocktroopers will probably become high class PMCs or Union of Terra special forces. I’m not too keen on the whole space nazi look, so headswaps are probably on the way. The rifle squad is available here. Yet more sets of miniatures I’ve had my eye on for a long time (starting to see a pattern here). 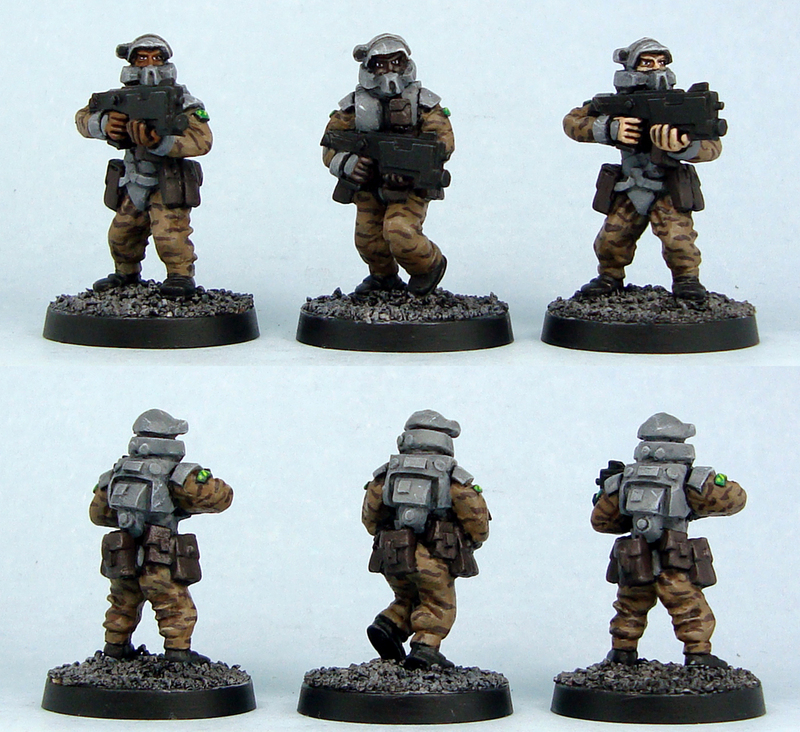 The troopers are a welcome addition to my pool of generic scifi infantry, the officer was nice enough to warrant a spur of the moment purchase and the inspectors are some of my all time favourite models. 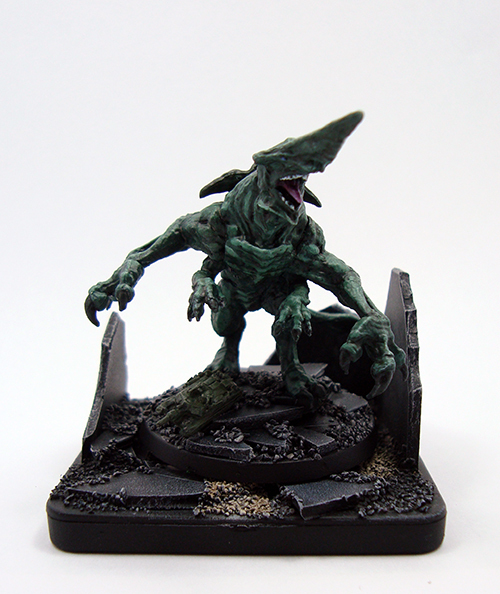 In fact, I’ve previously bought one of them, shown painted and converted here. They’ll serve plenty of generic roles, I’m sure. 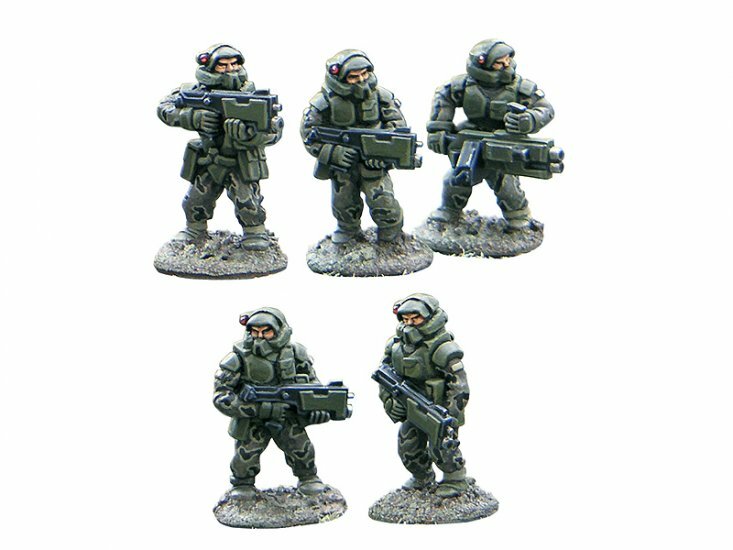 You can get all the minis shown from Heresy’s online store. I’ve had my eye on…for Utopia..blah blah. Same story as before. These are some of the finest miniatures sculpted in recent years. They’re actually nice enough to go into the “minis I want to buy even if there’s no use for them” category. Luckily they’ll fit my games nicely. I also bought a pack of spare heads, since I need some more female troopers. 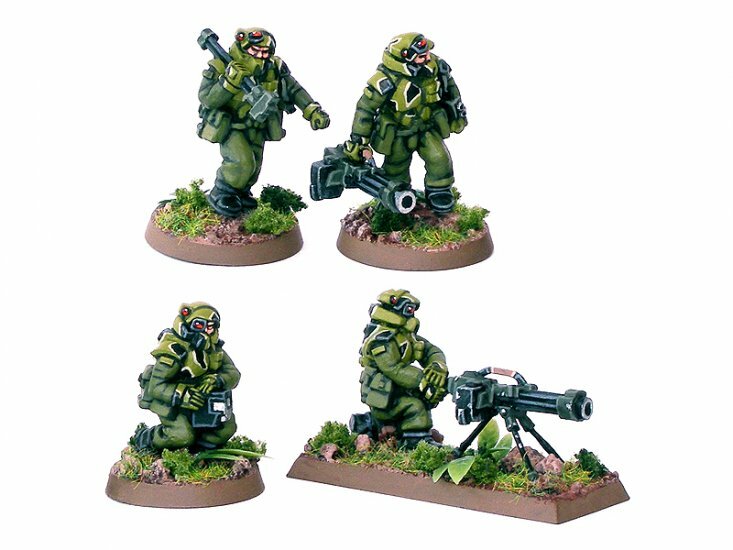 The sniper will likely be painted in Colonial Marine colours, for when our current sniper croaks. 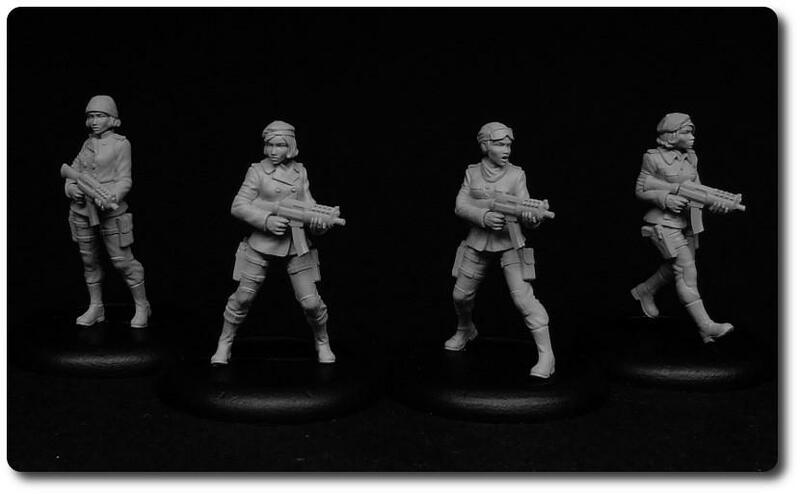 All of these lovely ladies can be bought directly from Statuesque Miniatures. Yet another long time want, I ended up buying a whole lot of these at Salute. Actually, I only bought two packs originally, and then mentioned this to a certain frothery badger. “Oh, I’ve a box of those I’m looking to unload!” he said. “I’m running out of cash!” I said. “No stress mate. It’s a great deal though!” he said. “I’ll hit the ATM.” I said. 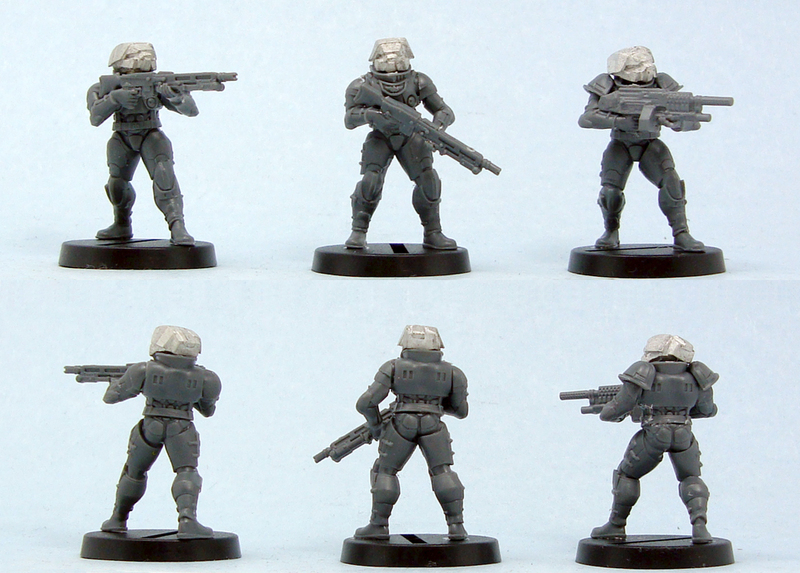 And so I’m now an owner of a sizable force of yet more scifi infantry – it was a great deal though. These fellows will likely serve in Utopia as Terran Union infantry. Hungry for more? Go check out Pig Iron Productions. With lots and lots of new troopers, I better have a place for them to sleep in. 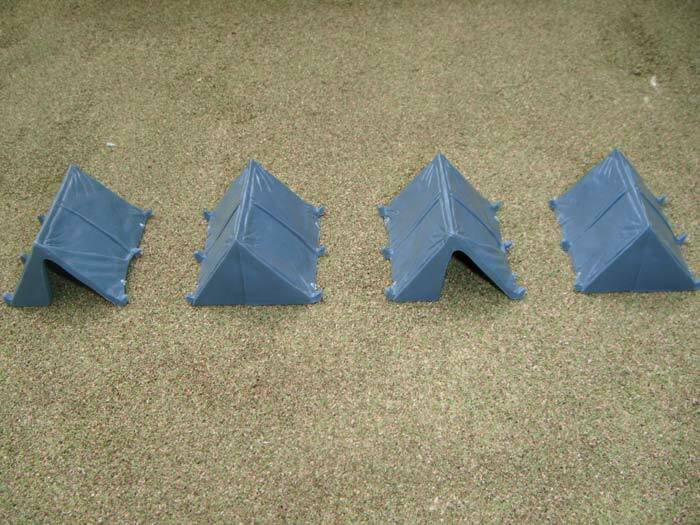 Renedra had these small plastic tents on sale, so I bought a few packs. These and more are available in the Renedra webstore. We frequently tend to run into situations where we need various tokens and counters in games of Utopia. We’ve been using a variety of dice, washers and whatnot, but I’ve been eyeing some groovy plastic ones for a while now. A retailer was stocking these wonderful Litko counters at Salute, so I picked up a few bags – one of overwatch counters and another of casualty markers. The casualty ones have already seen use in games of DnD! If those look tasty, take a look at Litko’s site, there’s plenty more! Phew, if I’m not far wrong, that’s pretty much what I picked up…no, wait, I did pick up a Platformer construction set from Artemis Black, but this post has gone on long enough, so I’ll leave it at that.